NASA has cancelled its first-ever all-female spacewalk, slated to take place on Friday, citing "spacesuit availability" on the International Space Station. Details: NASA astronauts Christina Koch and Anne McClain were expected to conduct a spacewalk to perform maintenance on the ISS. But during a more than 6-hour spacewalk to repair batteries on the ISS last week, McClain discovered that a medium-sized spacesuit fit her better than a large. "McClain learned during her first spacewalk that a medium-size hard upper torso — essentially the shirt of the spacesuit — fits her best. Because only one medium-size torso can be made ready by Friday, March 29, Koch will wear it," NASA said in a statement Monday. Astronaut Nick Hague will take McClain’s place. Between the lines: Preparing a spacesuit to keep an astronaut safe in the harsh space environment is no easy task, and it's made harder by the old age of many of the spacesuits on the ISS. NASA's decision to go with a ready, but larger, spacesuit and swap out astronauts is based largely on which suits are already prepared for use, rather than diverting crew time and effort to getting a smaller suit ready. 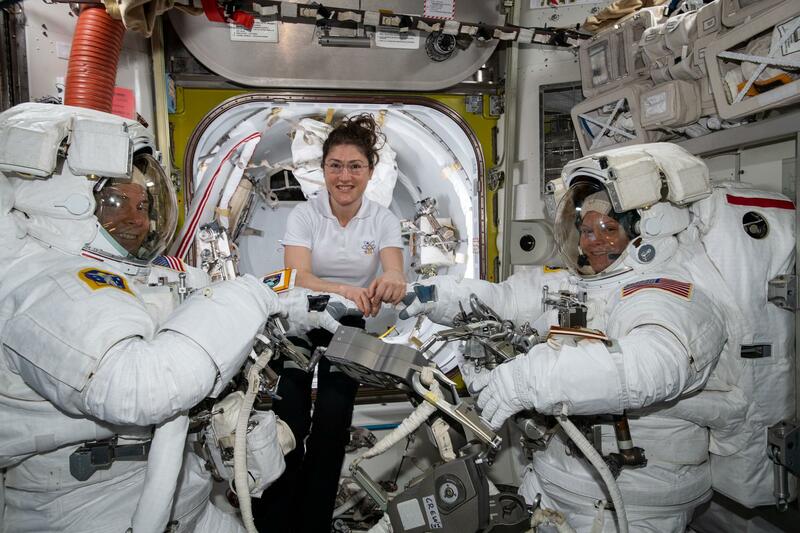 A spacesuit malfunction is one of the key safety concerns during a spacewalk.